Play by Ray Cooney & John Chapman. Centenary Theatre. Director: Janine Francis. Chelmer Community Centre, Brisbane. November 4-25, 2017. The premise of Ray Cooney and John Chapman’s farce There Goes the Bride is a switch on the time-travel aspect of Mark Twain’s A Connecticut Yankee in King Arthur’s Court coupled with Mary Chase’s hallucinatory Harvey, whereby an ad-executive gets a bonk on the head and wakes up with a 1920’s flapper by his side which only he can see. It’s the morning of his daughter’s wedding which creates chaos for everyone involved; the non-virgin bride, his pompous mother and forgetful father, his no-nonsense co-business partner, the groom’s millionaire Aussie father, and his harassed wife. With so many balls in the air, director Janine Francis does a sterling job of keeping them all in play. 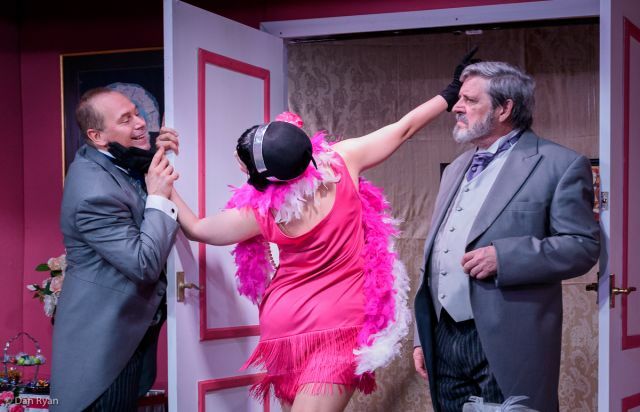 Michael Lawrence as Timothy, the advertising honcho whose latest campaign for a brassiere company materialises at his side, is marvellously farcical in the situation and indulges in a mean spot of the Charleston with his newly acquired paramour. Melanie Pennisi is a ton of fun as the bimbo-istic flapper Polly, who appeared to be Maisie straight out of The Boy Friend complete with fetching cloche-hat. Rod Feisch (Gerald) made a meal of being sock-less, Lauren Thompson was perfect as the prone-to-tears bride Judy, whilst Brad Oliver’s delivery of Babcock with a broad ocker accent was a brilliant conceit. 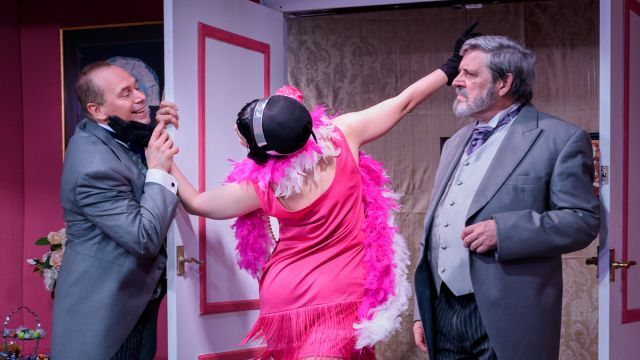 Good support and timing came from Nathaniel Young (Bill), Jill Brocklebank (Daphne), and Helen Ekundayo whose mother-of-the-bride flustered with brio. Despite being written in 1974 the piece still stands up. It’s a funny farce and this company do it justice.